UniFirst Facility Service programs feature Purell®, which is widely recognized as the nation's number one hand sanitizer. Purell®, the nation's number one hand sanitizer, is an integral part of a complete UniFirst Facility Services Program. Purell is an alcohol-based antibacterial gel that kills 99.99% of most common germs that can cause disease, and it's specially formulated with moisturizers to leave your hands feeling soft and refreshed. It’s an essential component of your total hygiene system. The Centers for Disease Control and Prevention (CDC) recommends hand sanitizers like Purell for disinfecting when soap and water are not readily available. For businesses of every kind, UniFirst Facility Service programs offer a variety of Purell products, dispensers, and refills so you never run out of the hand hygiene products you need. Purell Instant Liquid Hand Sanitizer is a Bag-in-Box Dispenser refill thatcomes in 800ml and 1000ml economy sized cartridges for universal fit. Purell Instant Hand Sanitizer foam is a 1200ml sealed refill of antimicrobial non-aerosol foam containing 70% ethyl alcohol and four moisturizers to help keep skin hydrated. Purell Instant Hand Sanitizer with Dermaglycerin combines a sanitizing formula with high performance moisturizers in an ample 1000ml package. Meets CDC and JCAHO guidelines. Purell Instant Hand Sanitizer Gel is a 1200ml refill bottle designed for an automatic hands-free dispenser. Purell Green Certified Instant Hand Sanitizer is the world's first green certified hand sanitizer, made from 100% naturally renewable ethanol. Refill features GOJO SMART FLEX™ technology in a lightweight, recyclable bottle made with 30% less material. Purell Hand Sanitizing Towelettes are available in 100, 1000, or 4000 count boxes containing sealed packaging to keep wipes moist and ready for use. Purell Sanitizing Wipes are non-linting, durable wipes textured for superior cleaning. Available in a 175-wipe canister or a 1200-wipe pouch. 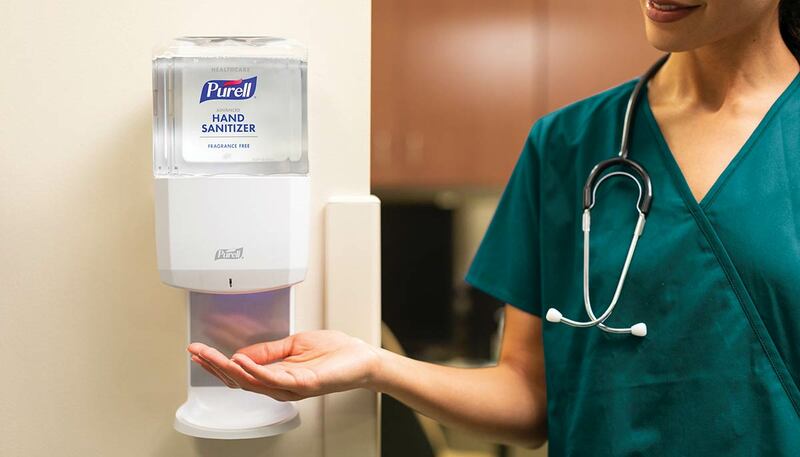 UniFirst hand sanitizer services includes commercially tough Purell hand sanitizer dispensers for economical portion control using either manual or “touchless” automatic operation. See our complete line of Purell hand hygiene products online in the UniFirst Facility Service Programs Catalog. Start UniFirst hand hygiene services today. Call (800) 455-7654. Browse our online catalog and choose from a wide selection of Purell® products and commercial dispensers. Conveniently customize a hand sanitizer service quote for your company.